Moving across the country to Los Angeles nearly 15 years ago meant boning up on many aspects of life in the West. This included earthquakes, of course. Until you actually feel one, you have no idea. I’d learn fast about bracing myself in a doorway, huddling under a desk, staying clear of power lines, never hanging anything over the bed, keeping flashlights in several areas of the house, and having a crank radio on hand. I’d find out about the U.S. Geological Survey’s excellent website (in the time since I began writing this, a mild shaker was recorded midway between here and San Francisco). So far, our three days’ worth of bottled water, canned beans, and tuna remain unused, but we make sure to keep them updated. California’s costliest earthquake occurred in 1994, just 15 miles north of where I live. This past fall brought new awareness. The Thomas, Creek, Skirball, and Rye wildfires blazed close enough that smoke filled the horizon. There was a mauve-colored end-of-days cast over everything. The air smelled acrid; all was covered with silty ash. Going outside was ill-advised, and if you had to, wearing a drywall respirator mask was a good idea. Most of the friends with whom we’d seek shelter were up north, but for a few days, fires blocked all routes that way. My husband and I took inventory of the documents, essentials, possessions, and clothing we’d take if we had to pack up and drive south to ... who knows where? What went unsaid was that we may be leaving our house for good. We were lucky; we didn’t have to evacuate. Others haven’t been so fortunate this year. 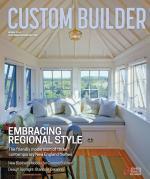 As we put this issue of Custom Builder to bed, heavy rains are falling in California. Good for the water supply, but very bad for the residents of Santa Barbara who have been issued mandatory evacuations in the event of mudslides in the burn areas from the Thomas Fire. Experts tell us to expect more floods, fires, and fierce storms because climate change is playing an increasing role in natural disasters. As you’ll read in “Ready for Anything,” custom builders are preparing for this. Senior editor Susan Bady talked to several who realize the urgency of including disaster prep in their designs, such as battery backup systems, safe rooms, moment frames, and pier-and-beam construction. In this issue, builders that work on custom homes in coastal areas, as well as earthquake- and flood-prone ones, share ways to build for resiliency that pencil out for the builder, reassure the buyer, and offer sustainability in the form of a beautiful home that outlasts much of what nature tosses at it. Comments on: "Being Prepared—Resilient Design"